You’ve got an 8GB Flash Drive. It’s completely empty and you want to copy a large file to it, let’s say 5GB. However, you keep getting a message stating ‘not enough free space’, despite the fact there is plenty of ‘free space’ on the Flash Drive. Why does this message appear? 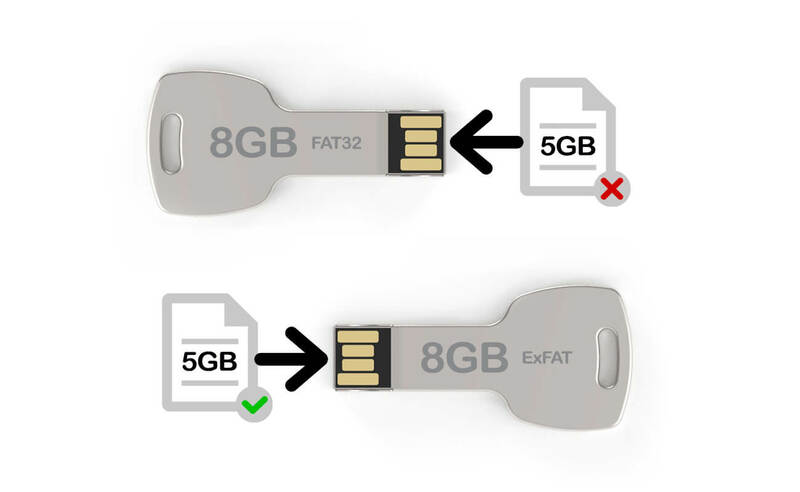 Most USB Flash Drives are formatted with something called an ‘FAT32 File System’. This system was created in 1995 and, for computer-protection reasons, imposes limitations on copying a file to your Flash Drive if it exceeds 4GB in size – this was a lot of data back in 1995! However, there is something called the ‘Extended File Allocation Table (ExFAT) created by Microsoft that forms part of our solution for Microsoft Windows users. Here at Flashbay we use ExFAT to format our 64GB models or Flash Drives that have individual files larger than 4GB data preloaded onto them. All of our other drives are formatted with the FAT32 system. 3) You will now see a box with a ‘Format’ option. Select ‘ExFAT’ from the dropdown menu. There may also be an option for NTFS, this can also be used in some cases. More information here (in English). 4) Click ‘Start’ and the switch from FAT32 to ExFAT will commence. This will take about 2 minutes. That’s it. Now you can copy files in excess of 4GB to your Flash Drive, if you have enough space on it of course! Well, I too had this same problem and I thought to myself that Windows doesn't math it seems! But after knowing the fact that these drives are FAT32 type and maximum file size is 4GB I got my answer. After knowing the fact, I started to search answers for it and then one site I found a software named GS Richcopy 360. Reviews were quite impressive so I tried it and it did solved all my problems including long path name support. Now, I have been using this software for around 2 years and its just amazing. Try it hope it helps! I was also unable to copy files to my Hard disk the file size was 8 GB and hard disk was 150. I didn't knew what was the problem at that time. After searching I found that it supported FAT32 file type and more than 4 GB file could not be copied. After trying many software which I didn't found satisfactory I found GS Richcopy 360. Although its a paid software but its just awesome. I copies the file file permissions too. Not only that it also solved my problem of long path name. Its other features include multi threaded file transfer, pre scheduled file transfer, email notification when the transfer is done and many more. Try it, its awesome!